The trio of Paul Krugman, Larry Summers, and Brad DeLong once again are arguing about policy. And once again, they are showing the limitations of the blinkers that mainstream economics imposes upon its true believers. Larry Summers in this article defends the Fed Reserve rate hike on the grounds of the need of monetary policymakers to preserve "confidence" in the currency, which generated this response by Brad DeLong. Throughout the debate, the factoid that rate hikes improve investor confidence is assumed, without any reflection whether this is actually the case. Paul is certainly correct in his model but I doubt that he is in fact. Once account is taken of the impact of a currency collapse on consumers’ real incomes, on their expectations, and especially on the risk premium associated with domestic asset values, it is easy to understand how monetary and fiscal policymakers who lose confidence and trust see their real economies deteriorate as Olivier Blanchard and his colleagues have recently demonstrated[*]. Paul may be right that we have few examples of crises of this kind but if so this is perhaps because central banks do not in general follow his precepts. I would note that Summers changed the scope of discussion by adding in fiscal policymakers to the discussion. I argue that fiscal policymakers are the only policymakers in developed countries that need to worry about "confidence," so he is half right. However, this has nothing to do with the Fed decision, so I will narrow the discussion to just monetary policy. There are two sets of reasons that investors can "lose confidence" in a country. Changes in regulatory or tax policy that is seen as unfriendly to business. Monetary policy has nothing to do with these type of changes. Changes in macroeconomic policy that leads to either weaker growth or inflation.This is where Fed policy decisions fit in. Focussing on the second class of reasons, it seems that a rate hike would only increase confidence by investors if it helps tame inflation. However, there is no reason for investors to care about small changes in the inflation rate, say from 1% to 2%. If you are a bond investor, you do not actually gain or lose money based on the price level. You make money based on changes in the nominal value of your bond holdings. If I have a position in U.S. Treasurys as a Canadian, I make profits if their price goes up, and I could care less what happens to price level experienced by U.S. consumers. A rate hike is damaging for my bond position, as that usually causes a rise in yields (yield up, price down). If I am a stock investor, higher inflation is associated with higher nominal growth, which theoretically should help the top line growth of the corporations I invest in. Since stock valuations are highly sensitive to growth rates, I see no reason to fear a small increase in inflation. The investors who cheer for rate hikes are currency investors who herd into carry trades. However, as people who have been killed shorting the yen over the past decades have learned, carry is not the only determinant of currency valuation. 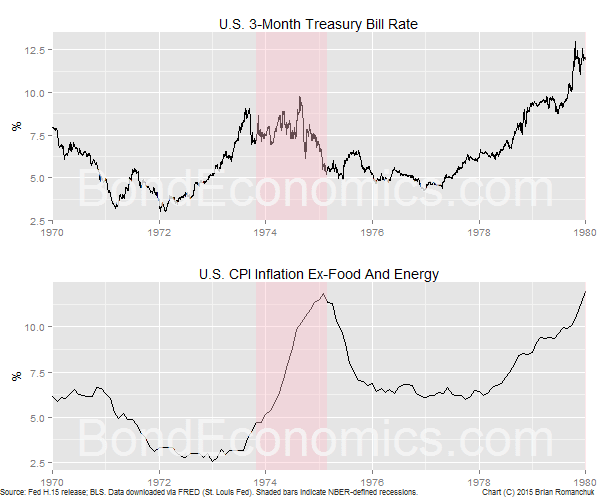 Looking at the chart at the top of the article, we see that the large rise in inflation rates during the 1970s (the only episode of widespread inflation in a modern economy we can point to) was actually associated with a corresponding rise in nominal interest rates. "Neo-Fisherism" is a big "new" concept in mainstream macroeconomics, but it is only "new" because mainstream economists have a very selective memory when it comes to citing the economic literature. During the 1970s, there was wider acceptance that interest rates were a cost of doing business, and so an increase in interest rates will result in firms raising prices to compensate. This view is still represented in post-Keynesian inflation analysis. Furthermore, households need added income to validate higher prices, and higher interest income is an important source of increased purchasing power. If we drop the assumed real interest rate relationships and look at the income flows within an economy, an economy with zero interest rates has almost no chance to have a fiscal spiral that can fuel a sustained rise in inflation. ** This is borne out by the experience of Japan post-1995, and elsewhere after the financial crisis. If you are worried about inflation, rate hikes are what you need to be concerned about. In other words, Larry Summers has a view which is precisely backwards with regards to policymaking choices. It's 2016. We do not have hoverboards, nor do we have mainstream economics that can do anything other than "explain" historical events by revising parameter estimates in response to persistent model errors. It's early days, but I am not confident that the situation will change in 2017 either. * The referenced article by Blanchard, Chamon, Ghosh, and Ostry is about capital inflows and their effects on economies. Although interesting, it is mainly of interest for developing countries, as the major economies routinely absorb large cross-border capital flows without anything happening, beyond the tendency for synchronised asset bubbles. Whether those bubbles are the result of capital flows or "globalisation" more generally is an open question. In any event, the article has no bearing whatsoever on Fed policies; it appears to be a random citation Summers threw in there. ** There are some examples of high inflation due to a currency collapse, such as in Iceland after the financial crisis. However, Iceland imports a great many consumer products, such as beef, where most other developed countries are self-sufficient. Moreover, this really represented a largely one-time price level shock, and not a sustained inflation. "There are some examples of high inflation due to a currency collapse, such as in Iceland after the financial crisis. " Is it high inflation, or a high Consumer Price Index? The problem is that the index is weighted and wouldn't update its weights immediately. So it goes on including a particular amount of beef in the index *even in the population essentially stopped buying the import due to the price rise*. As ever we have to understand what the aggregate number means, and be careful of quoting an aggregate number that doesn't actually reflect reality which then changes expectations adversely causing wage/price spirals. As I should have added (I will amend the post), the "inflation" was not sustained afterwards; it was a one-time price level shock. However, it did represent a fall in the standard of living, so it would be unfair to ignore it completely. I'm not suggesting ignoring it, but it would be interesting to see the volume effects. IIRC McDonalds withdrew from Iceland in 2009, and of course they use beef. Well, if you have a Big Mac Attack, having some cod instead might be unsatisfying.